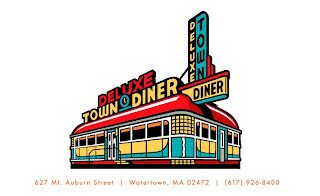 Clearly the waffles at the Gilder Diner in Scranton, PA, are no match for the Deluxe Sour Cream Flapjacks at the Deluxe Town Diner, 627 Mount Auburn St, Watertown, MA, Tel +1 (617) 926-8400. Because there is no way you would leave a plate of the aforementioned Flapjacks half eaten. Like little fluffy clouds they are. Until you smother them in Vermont's finest, that is. And get this. Apparently the sweet potato pancakes are even better. That's according to one of the locals who saw me taking pictures and decided to share a few tips. As with most of my diner experiences thus far, the scrambled eggs were a bit dry and the homefries unremarkable (I think they had chicken seasoning on them). But the sourdough toast was very good, the sausage patty was tasty, and the flapjacks were awesome. So... if Barack ever comes here and orders the Colossal Hungry Person's Breakfast, I recommend eating all of the flapjacks and leaving half the homefries and eggs. Actually, I recommend ordering a full stack of pancakes or waffles and eating the lot. The only dilemma will be deciding between sour cream buttermilk flapjacks, jo'nny cakes, potato pancakes, sweet potato pancakes, blue corn pancakes, or buckwheat ployes. You'll also need to decide between pecans, blueberries, bananas and dried cranberries. Or bacon. Mmmm... bacon. And one more thing... they serve real tea in pots. Tea bags are so not cool. You can put a cat in the oven, but that don't make it a biscuit. Wesley Snipes isn't the only person confused about what makes a biscuit. Most of America (Mr Snipes included) will describe a biscuit as soft and cake-like, not hard and crunchy. The UK tax man tried to argue that Jaffa Cakes (soft, baked treats popular in Britain) are biscuits, which is amusing, since Wesley and the tax man don't usually see eye-to-eye. And despite only selling "cookies" and "crackers", America's Nabisco was originally known as the National Biscuit Company. I guess Nacracko sounded a little too close to crack 'ho. So, what kind of biscuit did I have for breakfast this morning? A Buttery Country Biscuit from the South End Buttery, 314 Shawmutt Avenue, Boston, Tel +1 (617) 482-1015. Soft on the inside, crunchy on the outside, and crumbly all over. It tasted pretty good, but I have to wonder about the wisdom of serving a biscuit as a sandwich. Not only do biscuits disintegrate under pressure, but this one was such a towering stack of biscuit, baked egg, bacon and biscuit, that you'd need a Cameron Diaz sized mouth to have any hope of getting your jaws around it. It was also missing the aged cheddar, and very dry, with no condiments or juices to balance things out. I now understand why Southerners and soldiers usually take their biscuits with gravy. Other options include bagels, "breakfast breads" (banana-date nut loaf, for example), pastries, and cupcakes. I think next time I'll try "Eggs in the Hole" or a "Peanut Buttery" (nutella and homemade peanut butter on toasted croissant). With most breakfast dishes priced under $6, the South End Buttery offers pretty good value.